Newly-elected Presidents inherit both the good and bad of their predecessors. Even though a new President must approve their continuance, once underway, plans and policies, carry a bureaucratic momentum. In April 1960, the Central Intelligence Agency had recruited 1,400 members of the Frente Revolucionario Democratico (FRD), an active group of Cuban exiles who had fled Cuba when Castro took power. 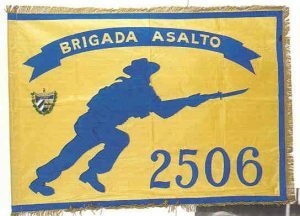 The group formed the Brigade 2506 and on April 17, 1961, more than 1,000 CIA-trained Cuban exiles landed at the Bay of Pigs on the southern coast of Cuba intending to overthrow Fidel Castro’s recently established government. The plan failed completely and the negative long-term impact is still part of Cuban-American relations. 18 August 1960: President Eisenhower approved a budget of $13 million for the operation. By 31 October 1960: most guerrilla infiltrations and supply drops directed by the CIA into Cuba had failed, and plans to mount an amphibious assault replaced further developments of guerrilla strategies. 18 November 1960: CIA Director Allen Dulles and CIA Deputy Director for Plans Richard Bissell first briefed President-elect John Kennedy on the plans. Dulles was confident that the CIA was capable of overthrowing the Cuban government. 29 November 1960: President Eisenhower met with the chiefs of the CIA, Defense, State, and Treasury departments to discuss the idea of an invasion. Those present expressed no objections and Eisenhower approved the plans. He hoped to persuade Kennedy of the plan’s merit. One of President Kennedy’s main concerns, was that the operation remain covert not just to Castro but disassociated from the United States. Not surprisingly a number of Castro’s agents were among the Brigade and they shared the intelligence that they collected on the upcoming invasion. The planned invasion site was the town of Trinidad. It offered a US-friendly population, a good port, and nearby mountains to escape to if necessary. As the invasion date grew near, Kennedy grew nervous about the site. It was too associated with the United States making it difficult to deny US culpability. He demanded a change. A month before the invasion, the CIA decided on Bahía de Cochinos (Bay of Pigs). Unfortunately, this was a place Castro knew well and whose population loved Castro. The plan had three phases and early in the morning of April 15 six Cuban-piloted B-26 bombers struck two airfields, three military bases, and Antonio Maceo Airport in an attempt to destroy the Cuban air force. This phase was successful: the attack destroyed most of Castro’s combat aircraft. Castro raised complaints to the UN. The US denied all. April 16 was Phase Two: a second bombing of targets. But the UN attention to the initial attack worried Kennedy and he cancelled Phase Two. April 17. The landing did not go well. Many men lost their equipment because of the rough approach to the shoreline. From an article at the CIA site: Once ashore, they were met instantly by Cuban armed forces who outnumbered them. The salvaged and undamaged Cuban planes that had survived the April 15 strikes, the very planes that should have been destroyed that morning had Kennedy not canceled the planned strike, were now flying overhead wreaking mayhem on the Brigade. The invasion did not go as planned, and the exiles soon found themselves outgunned, outmanned, outnumbered and outplanned by Castro’s troops. From there things got worse. Rescue attempts went poorly. A few from the Brigade escaped, but Cuban forces captured most of the Brigade. April 24, 1961: President Kennedy accepted “sole responsibility” for the invasion, but on November 30 he authorized an aggressive covert operations (code name Operation Mongoose) against Fidel Castro in Cuba. Air Force General Edward Lansdale led the operation. Operation Mongoose was to remove communists from power, including Castro and it aimed “for a revolt which can take place in Cuba by October 1962”. US policy makers also wanted to see “a new government with which the United States can live in peace”. April 14, 1962: a Cuban military tribunal convicted 1,179 Bay of Pigs attackers. President Kennedy tapped James Donovan to negotiate the release of the prisoners. This the same James Donovan who had just successfully negotiated the release of Gary Powers from the U2 incident on February 10, 1962.
but the far more historic and nearly apocalyptic Cuban Missile Crisis in October 1962 intervened their negotiations. Due to Donovan’s personality, the negotiations continued following the crisis. While playing cards with the President of Pfizer Pharaceuticals, Donovan continued to think about what would succeed with Castro and the idea of exchanging the prisoners for much-needed medicine and food might work. On December 21, 1962, Castro and Donovan signed an agreement to exchange the 1,113 prisoners of the failed Bay of Pigs invasion for $53 million in food and medicine and on December 23, Cuba released the participants in the Bay of Pigs. In the early hours of April 17, 1961, some fourteen hundred men, most of them Cuban exiles, attempted to invade their homeland and overthrow Fidel Castro. The invasion at the Bahia de Cochinos — the Bay of Pigs — quickly unraveled. Three days after landing, the exile force was routed and sent fleeing to the sea or the swamps, where the survivors were soon captured by Castro’s army. Despite the Kennedy administration’s initial insistence that the United States had nothing to do with the invasion, the world immediately understood that the entire operation had been organized and funded by the U.S. government. The invaders had been trained by CIA officers and supplied with American equipment, and the plan had been approved by the Joint Chiefs of Staff and the president of the United States. In short, the Bay of Pigs had been a U.S. operation, and its failure — “a perfect failure,” historian Theodore Draper called it — was a distinctly American embarrassment. Bad enough the government had been caught bullying and prevaricating; much worse, the United States had allowed itself to be humiliated by a nation of 7 million inhabitants (compared to the United States’ 180 million) and smaller than the state of Pennsylvania. The greatest American defeat since the War of 1812, one American general called it. Others were less generous. Everyone agreed on this: it was a mistake Americans would never repeat and a lesson they would never forget. Apparently we did. Several more times. And still are.